Although F-105 Thunderchiefs primarily flew the majority of USAF bombing missions against North Vietnam, "Thud" pilots also chopped down 27.5 NVAF MiG-17 from 1966 to 1967 – a tally in excess of those by F-4 crews assigned to protect them! 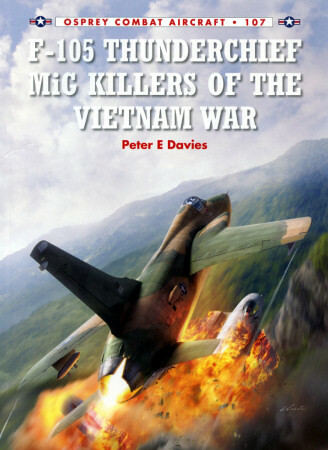 Now author Peter Davies superbly summarizes this MiG-killing record in Osprey's F-105 Thunderchief MiG Killers of the Vietnam War. Beginning with a chapter dedicated to the Thunderchief's development and early operational history, subsequent sections in Davies' instructive narrative interweave data on F-105 pilots' training and tactics with dramatic descriptions of MiG battles. Because it occurred in Chinese airspace and could not appear in official records, for instance, the first F-105D MiG kill occurred 10 May 1966. During a campaign against petrol, oil and lubricant (POL) storage sites, four MiG-17s latched onto the lead element at 5000 ft and 480 knots. Despite sustaining serious damage from 23 mm and 37 mm cannon shells, Maj Fred Tracy pursued the enemy aircraft while firing 200 rounds of 20 mm ammunition without the aid of his gunsight. As Maj Tracy recounts, "'I maneuvered to superimpose my pitot boom over the MiG, squeezed the trigger and saw the 20 mm rounds sparkling along the left fuselage and wing root of the MiG. His left wing folded over the tail and in an abrupt left turn he went into a cloud at about 2500 ft'." Nearly 70 historical photographs flavor the account. And those model project ideas can find some inspiration in Jim Laurier's 30 profiles. Two appendices and an index complete this helpful publication.